A good show of 712 head last Wednesday Night met with another fine trade, fat hoggets sold to £110.00 with a lot of heavy sheep on offer. Light in spec hoggets were keenly sought with a pen of 23kgs selling to £109.00. Fat ewes were a great trade topping at £112.00, breeding sheep sold to £188.00 for a pen of 2 year old. Mule ewes, 11 ewes and 19 lambs. Trevor Knox, Armoy, 23kgs, £109.00. D McKillop, Cushendall, 25kgs, £105.00. W Donaghy, Rasharkin, 30kgs, £106.50. Colm McHenry, Ballycastle, 25kgs, £105.20. Alistair Bartlett, Armoy, 22½kgs, £102.00. Trevor Knox, Armoy, 30kgs, £107.00. John Black, Ballycastle, 27kgs, £105.00. B Mullan, Ballymoney, 24kgs, £106.00. Damien McCloskey, Loughguile, 26kgs Blackface, £104.20. Eamon McKeegan, Cushendall, 23½kgs Blackface, £101,50. John Holmes, Armoy, 26kgs, £104.00. Sam Morrison, Liscolman, 24kgs, b/c, £97.00. S J Glenn, Ballycastle, 28kgs, £105.00. John McKeague, Ballycastle, 30kgs, £105.00. Richard Morrison, Mosside, 24kgs, Blackface, £99.00. M Montgomery, Liscolman, 22½kgs, £97.00. Trevor Knox, Armoy, 20½kgs, £92.50. I McCaughan, Bushmills, 25kgs, £105.00. John McFadden, Newtowncrommelin, 21kgs, £88.00. Conor Dougan, Coleraine, 23kgs, £87.50. 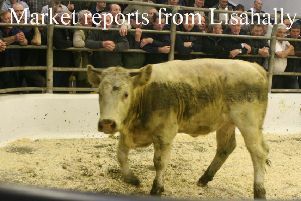 Damien McCloskey, Loughguile, 29kgs, £104.20. Norman Kyle, Bushmills, 22kgs, £103.00. Mark Morrison, Ballymoney, 21kgs, £101.50. 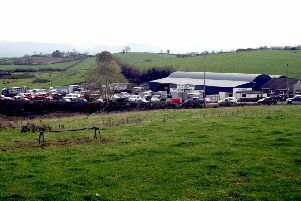 E McFetridge, Armoy, 11 ewes, 19kgs, £188.00, 11 ewes, 14kgs, £163.00, 10 ewes, 14kgs, £160.00. Donal McKillop, Cushendall, 1 ewe, 2 lambs, £120.00. John Black, Ballycastle, 8 springers, £100.00. Alex McAllister, Armoy, Suffolk, £112.00. Jas Currie, Ballymoney, Charollais ewe, £108.00. G Moore, Ballymoney, Texel ewes, £104.00. W Hanna, Ballymoney, Texels, £103.00. Colm McHenry, Ballycastle, crossbreds £93.00. W McAuley, Cushendall, Cheviot, £87.00. Robert Hodges, Armoy, crossbreds £83.50. John McKillop, Cushendall, crossbreds £76.00. Sam McConaghie, Mosside, Suffolk, £82.00. Gerard Devlin, Ballycastle, crossbreds £92.00. W Hanna, Ballymoney, crossbreds £88.00. P McCormick, Torr, £43.00, £27.00, £27.00, £21.00. D and P McKendry, Armoy, £27.00, £24.00, £25.00, £24.00, £28.00, £24.00. S J and D J Currie, Mosside, £27.00, £27.00, £26.00.